Looking for a way to make your lessons extra fun and engaging? This printable shark-crazy board game will keep your students on their toes while learning all about simple rhythms and time signatures. Chomp! is an exciting shark-chomping board game where players choose the best path and answer questions about simple rhythmic values and time signatures. To make things more challenging, sharks will be lurking in places where your opponent has hidden them. (It’s a little like Battleship.) If you land on one of these spaces you’ll get Chomped! This game is for two or more players. The first one to reach the dock with less than three Chomp! cards wins the game. Browse our posts for music flashcards that help kids drill every essential musical symbol, including note names, rests, and dynamics. Whether you’re looking for fun classroom activities or resources for students to work on independently, this post has something for you. We’ve rounded up music education products from around the web to help you find the best options for your music students. This roundup was created with the end of the school year and summer break in mind, but you’ll find many of these resources useful all year round. Carnegie Hall Park™ | Basic Skills Music Theory Board Game: Battle for a parking space while reviewing musical symbols and terms. Correct answers earn points, while wrong answers earn parking tickets. Blank question cards can be customized as well. 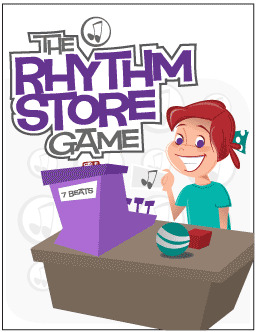 The Rhythm Store™ Game | Rhythm: Beats become currency as students make purchases and count out correct change. Knowing note values is a must in this retail-based game. The Piano Player Online Music Reading/ Note-Playing Challenge: With multiple difficulty levels, students can practice correlating notes on the staff to notes on a keyboard. A note is displayed, and students must identify it on an on-screen keyboard. Musical Families Online Game: This Little Einsteins game through Disney Junior challenges kids to find the missing instruments in time for a concert. Music Match Online Instrument Matching Game: This is a screen-based memory game where students search for pairs of instruments. Music Match Online Composer Matching Game: In this online match game, students search for pairs of composers. Classics for Kids Games: Composition, Rhythm Matching, and Note Name Online Games: The composing game allows kids to drag notes onto a staff and hear their compositions. The rhythm game has kids tap a rhythm on the space bar and gives immediate feedback. Finally, the note name game has students spell out words by correctly identifying note names. Shiver Me Timbres Interactive Screen-Based Instrument Family Game: Kids can play this visual, interactive game on PowerPoint, Keynote, or PDF. When presented with an image, the player chooses a category and receives immediate feedback on their choice. Flash cards are a great way to practice and solidify musical knowledge that needs to be rock solid. Note names and musical terms should become second nature to music students, and flash cards can help. Whether used in traditional drills or as part of flashcard races like Around the World, flash cards can provide the repetition necessary to commit music basics to memory. 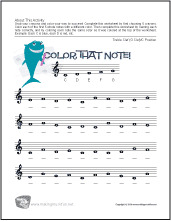 These sheets adds some color to note identification practice. Students choose a color to associate with each of the five notes in the position and then use the same color each time the note appears. I Thought That I Was Crazy Note Name Worksheet Treble Clef: Complete a poem using note names to fill in missing words. Crossword Note Names Worksheets: Note names spell out the words in these crossword challenges. 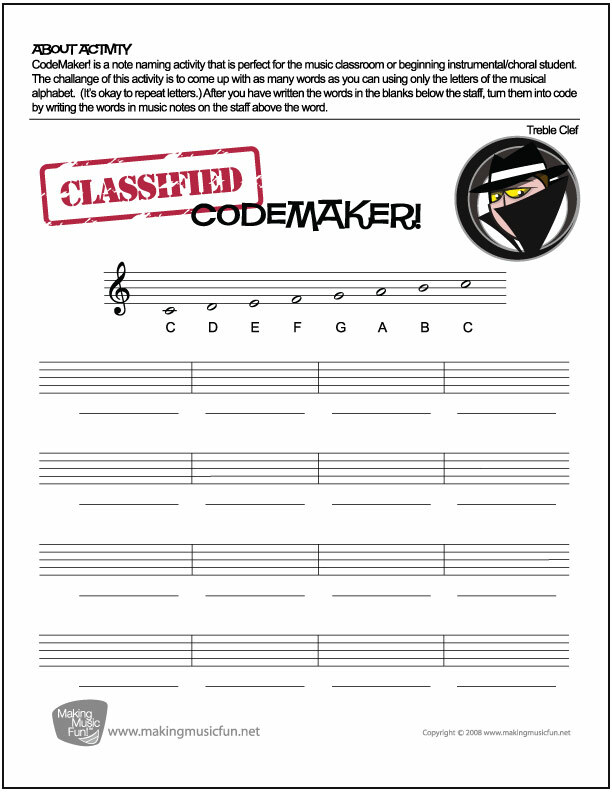 Code Breaker worksheets ask kids to decode messages by identifying note names. On code maker worksheets, students create their own codes by representing letters with their corresponding notes on the staff. M&M Challenge Note Name Worksheet Treble and Bass Clef: M & M candy pieces are both part of the worksheet and the reward. Staff paper is the perfect size for chocolate candies to be place on the staff to represent a requested note. Then, if the note is in the correct place, the music note becomes a sweet treat. Name That Tune worksheets practice both note naming and listening. After notes have been named, a keyboard or xylophone can be used to try to name the tune. Along with note names and musical terms, rhythms and intervals are two more skills that need to be rock solid. 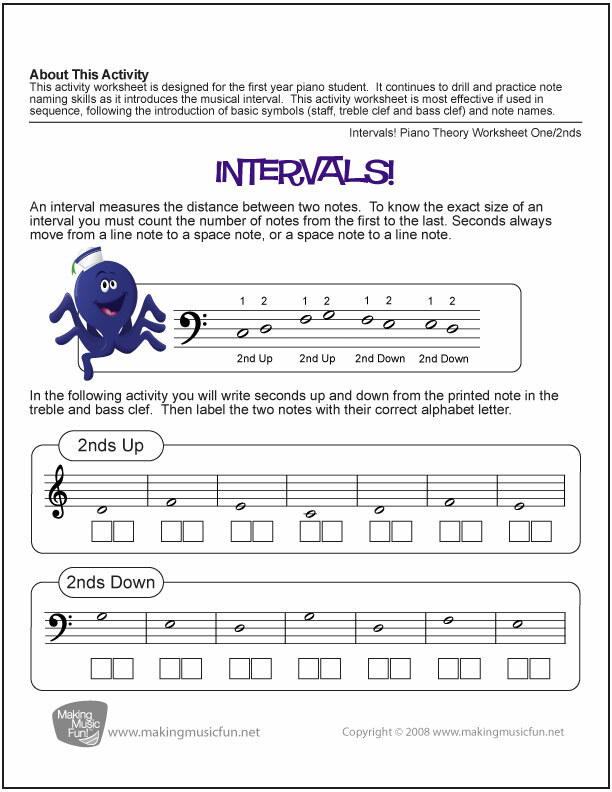 These free interval worksheets devote one worksheet to each interval type, introducing the interval and asking students to write in the second note to complete the interval. It All Adds Up! are free rhythm worksheets reminiscent of math speed drills. Presenting different note combinations as math equations prompts students to review note values again and again. 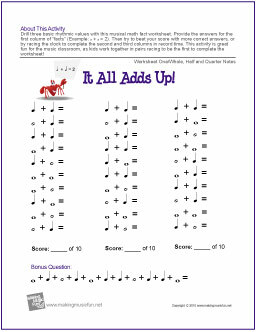 The worksheets make a fun speed challenge for students who are getting to know the rhythmic values well. At this time of year, teachers and students alike have summer on the mind. These worksheets can be used in anticipation of summer or provided for summer activities that students can do on their own. Those of us charged with teaching music theory basics have a big job. The concepts we teach are the starting points for our kids’ musical education. Whether they go on to sing, take piano lessons, play a musical instrument, or compose, they won’t go far without a solid grasp of music theory. Building a strong music theory foundation requires a mixture of facts and fun. Solid teaching and frequent review are essential, but that doesn’t mean it has to be dull. Below you will find ten resources for teaching and practicing music theory basis. They include both worksheets and games to make the content both clear and enjoyable for kids. Bring some color into note identification! Students create a color key at the top and identify like notes with like colors. This activity works well early in the note name learning process. Perfect for individual practice, partner work, or classroom flashcard races such as “Around the World,” these clear, simple flashcards will be used again and again. 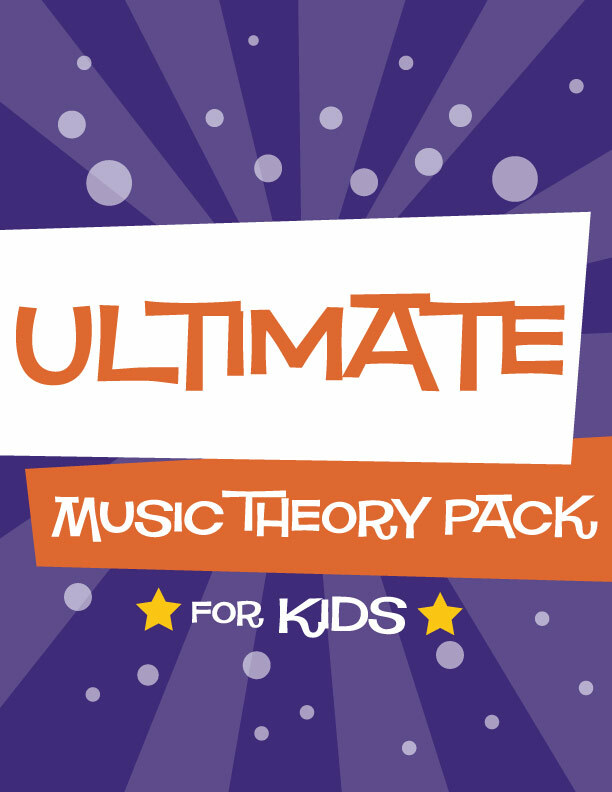 These flashcards are also a part of the Ultimate Music Theory Pack for Kids below, so if you are interested in these, check out the whole bundle. 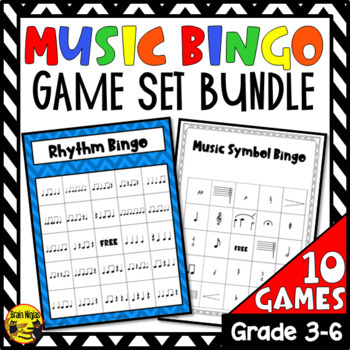 The classic BINGO game gets a musical twist in this bundle by Brian Ninjas. Ten different games, each focusing on a different music theory concept, are ready to print and play. Those who teach a wide range of grade levels will be glad to learn that the set includes games appropriate for grades 1-9. Students who know their note names will be able to crack the musical code and decipher the secret messages. Students learn and practice the relationships among note values as they add up note values like they would in math class. Different worksheet options are available depending on which rhythms students are familiar with. 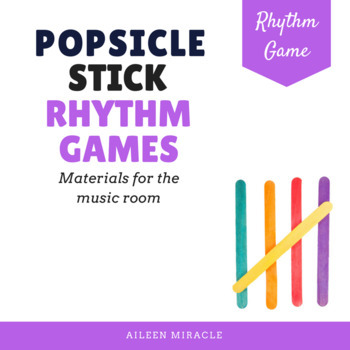 This four-star product from Mrs. Miracle’s Music Room features ten different rhythm games that are great for centers, small groups, and more. Many games also include worksheets related to the concept the game reviews. Music notes become currency as students count the cost of various items in note values, make change, and solidify their understanding of note values. With one sheet addressing each interval, students can practice seconds, thirds, fourths, and fifths individually. Then, they can put their knowledge to the test with the Ready, Set, Go timed interval identification challenge. This unit bundle from Sing Play Creatively focuses on note values with “I can” statements and provides rhythm practice suitable for grades 2-5. With 214 pages of activities, teacher instructions, printables, you are sure to find plenty of useful materials! 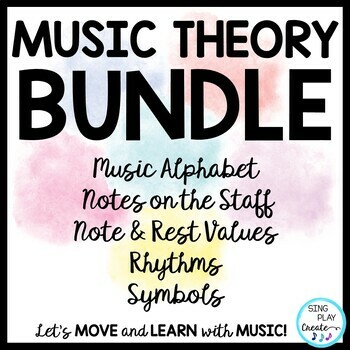 If you are looking for a way to add fun to music theory, this bundle is for you. Beginning students will have hours of fun learning and reviewing note names, note and rest values, dynamic symbols, and other basic musical terms. This bundle includes three different flashcard sets, two memory games, and two board games to reinforce the facts that all young musicians need to know. 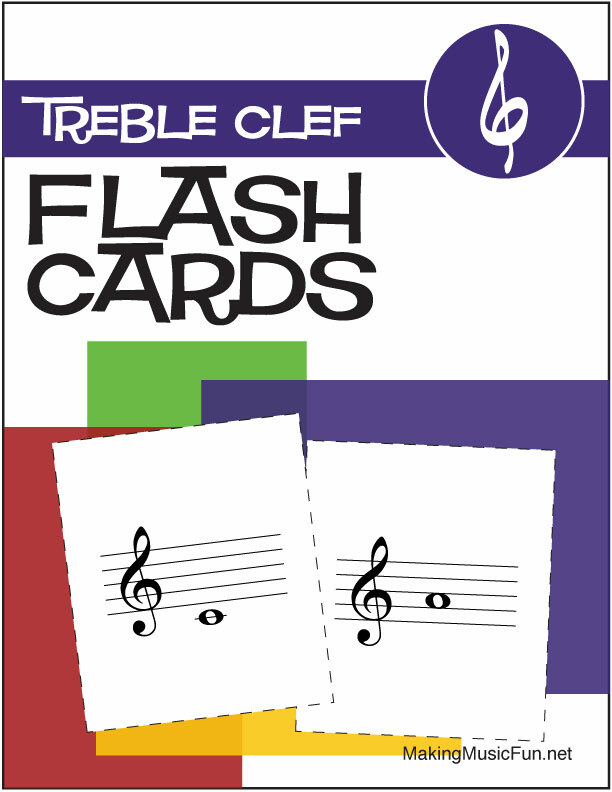 Flash Frog™ Flashcards: These colorful cards include note names, time signatures, note values, basic musical terms, and more. They can be used as flashcards or as a memory matching game. Carnegie Hall Park™ music theory board game: Printable game board, instructions, color-coded question cards, parking ticket cards, and score sheets are included—all you need is one die and a small toy car for each player. Players advance around the board answering questions from different categories, including dynamics, rests, time signatures, tempo terms, and note names. Players must answer 15 questions correctly, including at least one from each category, to win. Incorrect answers result in parking tickets—three tickets, and you’re out. Pirate Quest™ Basic Music Terms Board Game: Game board, 30 question cards, “walk the plank” cards, instructions, and answer key are included. Game players sail the high seas, moving across a pirate-themed game board by answering questions about musical terms. Watch out for wrong answers, though—three incorrect answers and you’ve walked the plank. The most basic beginning terms are marked with red dots, so these can be mastered first. Then, more challenging cards can be added. Once you download the digital file, you can print as many sets of flashcards, game boards, and game cards as you need. Several sets can be printed to teach and entertain entire music classes for a class fun day, review activity, or early finishers. Sets could be sent home with beginning piano or instrumental students or used during homeschool music study as well. Answer keys allow students to play independently. Game sets can be customized to your students’ current focus by removing cards, and some sets include blank cards so that you could add your own musical terms to review. When students have this much fun, they will gladly review note names and musical terms again and again. Preparing lessons for K-6th graders can be overwhelming and time consuming. Coordinating lesson goals and standards requires a lot of planning and prep time. Sing Play Creatively offers you a variety of solutions to your music class needs. Monthly Music Class Bundles can supplement or provide a core music curriculum for K-6 students. Whether a veteran or “newbie”, you’ll find the creative and original games, songs and printables provide you with ample materials for standards based teaching. The lessons contain Orff and Kodaly applications. Many of the the lessons can be adapted to several grade levels. 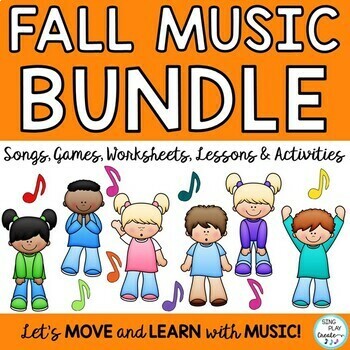 The Fall Music Class Bundle is full of engaging and easily teachable resources. It covers the music concepts of Melody, Rhythm, Pitch, Music Symbols and Terms, Notation, Solfege, along with Playing Instruments, and creating and composing activities. Lesson plans, teaching pages, rhythm practice pages, printables and flash cards-along with I Can statements are just part of the complete set of resources you’ll find in a monthly bundle. The Fall bundle includes some Kodaly classics, “I Had a Dog” and “Doggie, Doggie” along with a fun Kodaly and Orff combo lesson “Five Little Acorns”. The baseball themed set of Music Symbols, along with games is sure to be a “hit” with upper elementary students. The Fall vocal explorations use adorable graphics to help students broaden and become more confident in their vocal abilities. For Music Class essential teaching resources, check out the Sing Play Creatively Monthly Music Bundles. Sol-Mi often serves as the foundation to young students’ musical paradigm. Aileen Miracle’s comprehensive sol-mi package provides everything you need to immerse your 1st, 2nd, or 3rd grade students in sol-mi. 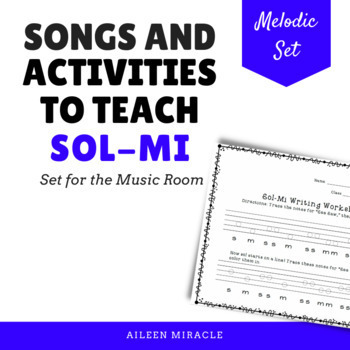 With 90 pages of varied resources, you can spend up to three months introducing, reinforcing, practicing, and enjoying sol-mi. Mrs. Miracle provides everything you need to embark on a thorough and multi-faceted study of sol-mi. Students will see, hear, write, and interact with this tonal pattern through multiple mediums, learning to recognize and reproduce its sound and notations. Whether you are completely new to this approach to teaching music or you are looking for some new resources to refresh your practice, this lesson pack will enhance your work. The Rhythm Race: Rhythmic Value Game (BUNDLE) from Shelley Tomich of PitchPublications.com is a great game for music lessons, music classroom centers, or as a resource for your sub plans. Students identify rhythmic values (whole note, half note, quarter note, quarter rests, etc.) in a race to the finish line.